At the the Church Online barcamp in Cologne. The Church Online barcamp needed to be evaluated according to each person’s own expectations, according to Ralf Peter Reimann, the Internet Officer for the Evangelical Church in the Rhineland: “The barcamp is a place where those from local church congregations, church districts, institutions, and Regional Church projects who are interested in the internet can present and share their experiences. We give consideration on a regular basis as to how we can meet the challenges of a digital age”. A particularly important aspect of this is the interaction between full-time staff and volunteer workers. The Melanchthon Academy in Cologne once again proved to be a very appropriate location for the event on this occasion. “This was the first time that we have had a hundred participants there”, said Yvonne Kälbli from the internet editorial team of the Evangelical Church of Westphalia. This was a clear increase over previous years and showed that the event had proved worthwhile. 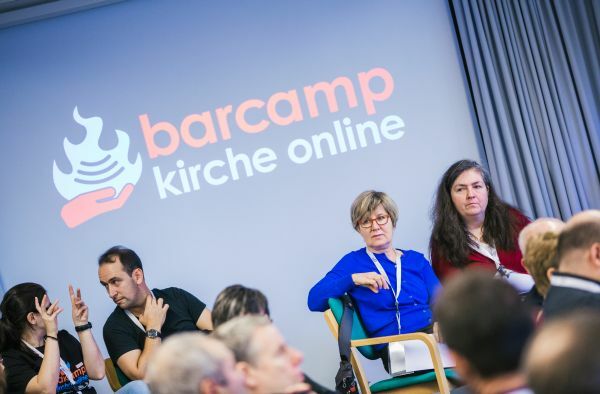 “For many people the barcamp has become an annual fixture” according to Ms Kälbli. Participants with a lot of expertise had come from all over Germany and even some individuals from Switzerland and Austria. Its success was also demonstrated in the fact that a Spring barcamp was being planned in the East German Regional Churches. The topics for the barcamp related to both well-known and new questions relating to the digital church. One of these concerned “augmented reality”, through which for example additional information can contribute by digital means to the expansion of the life of the congregation in concrete terms. Models for this could be a quiz on bell-ringing or the summoning up on your smartphone of pictures of your church during an earlier phase of its construction and relating this to the actual building of today. On Twitter, it was shown how using the hashtag #bckirche could communicate suggestions, ideas and comments. The feedback from the participants was entirely positive. “So many ideas, experiences and enthusiasm in one place“, “a very blessed and inspiring meeting!“ and “filled up the tank with a weekend of ideas from #bckirche“ were some of the things that were said. The next barcamp in Westphalia is planned from 28 to 30 September. The location will be a town in the Ruhr district.